The Big Score. The secret safes of a large manor house are rumored to be holding gold, precious diamonds, and ancient artifacts. Robbing the safes is constantly on the mind of a lot of notorious criminals. There’s only one problem—they are well guarded. But, apparently some robbers have the acquired skills and resources to pull off the biggest heist the city has ever seen—the big score. The thieves robbed the manor earlier this night. After the robbery they were forced to fight their way out, eventually escaping the scene. During the escape the manor owner has been stabbed, but luckily it wasn’t life-threatening. Now they risk being busted by the cops not just for a robbery, but also attempt for murder. Inspectors Linda Kowalski and Robert Henderson arrive at the crime scene. Police tape has been placed around to investigate the scene for evidence. They figured that the thieves were searching for the family treasure of the owner hidden inside the secret safes. A thorough search should be made of the crime scene. Help them with the investigation and find all the hidden clues to bust the gang of robbers. 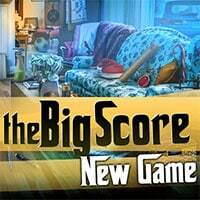 The Big Score is a free online hidden clues game on Hidden4Fun.